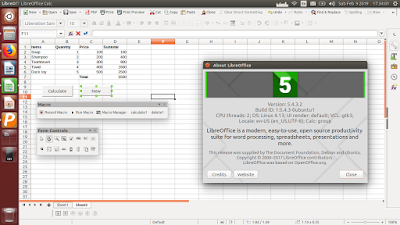 This is a step by step tutorial to make LibreOffice Calc macro examples with SUM function. We will make a simple cash register program within Calc. You will make use the =SUM() function to total the prices. You will create two macros and call them from two push buttons on the Calc sheet. Continuing my first macro tutorial ever, this is also intended for new comers without prior experience about macro but want to create one. Happy working! The program is really simple. It first calculate every item amount, then total all amounts. Only that. There are only two buttons, one to calculate the total price, and one to clear all cells. I hope you can grasp the basic by this. Create this blank table (from A1 to D7) as the place to run your macros later. This macro will calculate subtotals and total. Please remember, to record spreadsheet functions (SUM, AVG, etc.) you use click and Shift+click instead of typing the cell addresses and ranges. We will name this macro 'calculate1'. This macro will empty all cells. We will name this macro 'delete1'. Before adding any button, we need to test the created macros. Gif animation below shows the two macros as two toolbar buttons (see bonus section below to create your own custom toolbar) to call them quickly as I want. See I filled up the cells and pressed 'calculate1', then it calculates. See I pressed 'delete1', then all cells emptied. 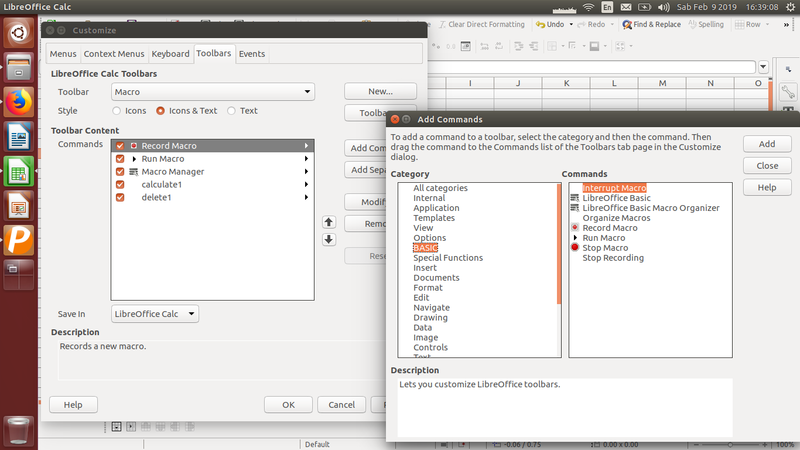 That means the test result is OK.
To add user interface elements like push button, you will need Form Controls toolbar. Go to menu bar View > Toolbars > Form Controls to show it. Add first button and assign 'calculate1' macro. Add second button and assign 'delete1' macro. See? It is very simple. Up to this point you have completed all necessary tasks. Now, play your buttons like in the first animation above. 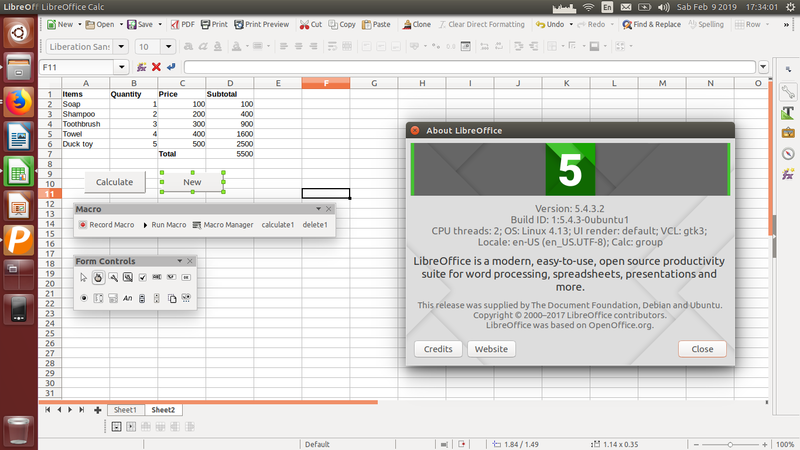 Congratulations, you have created first calculation macro on LibreOffice Calc. 2) call your custom toolbar: go to menu bar View > Toolbars > 'Macro' > it appears. That's all. I would like to say thank you to soukaina as her video Les macros avec le tableur Calc(LibreOffice) (in French) is the base of this tutorial. Thank you, your have made your video very clear, I can learn so much from your one video although I don't understand French. Anyway, the macros in this article still do not have feature to record every transaction or to calculate taxes or even more advanced, to print out the receipt. These macros are just the basic things. It is very exciting for myself as this is my first chance ever to learn about macro and I have been wanted to learn it since a long time ago. I hope I can record my own learning process in the next tutorials. Happy working! Just like the previous tutorial, I give you the same references once again.